Last week, I was home visiting my parents, and was reminded of something that happened almost 30 years ago. It was Friday night, August 1, and the Calgary Stampeders were hosting the B.C. Lions. This year, the Stampeders are a Grey Cup contender at the top of the standings with a young, talented quarterback. The Lions are near the bottom of the standings, struggling to find their offence and pinning their hopes on an aging quarterback who has been one of the best of his generation. 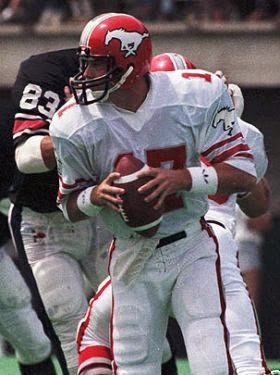 Thirty years ago, on a warm summer night in 1985, it was the Lions who were a Grey Cup contender at the top of the standings with a young talented quarterback, hosting the Stampeders who were at the bottom of the standings, struggling to find the right combination and pinning their hopes on an aging quarterback who was one of the best of his generation. Sadly, the home team, my beloved Stampeders and their young quarterback Bo Levi Mitchell, gave up an early lead and lost to the visiting Lions in 2014. It was a different result from 1985, but what made it so familiar was that, both times, I was watching with my mother. It was their sixth game of the season. It was a Saturday night, August 17, and they were playing at B.C. Place in Vancouver. It was a late start, 8 p.m. to be exact. The Lions had never lost to Calgary at B.C. Place, and they were one of the best teams in the entire league. The Stampeders were winless on the season, had fired coach Steve Buratto, and replaced him with Bud Riley. What unfolded was one of the best football games I had ever seen. My mom had come out of the bath and settled on the couch to relax for a few minutes before bed, so she watched with me. I found myself explaining the rules to her, and she caught on quickly. She got deeper into the game as it went on, and the Stampeders were hanging around. Calgary led 6-3 after the first quarter and 16-11 at halftime. I was surprised at how well the Stamps were playing. Joe Barnes was finally beginning to play like the quarterback they had acquired. Their defence was holding the Lions offence, and their quarterback Roy Dewalt in check. In particular, I remember pass rusher Vince Goldsmith who always seemed to be in the backfield after Dewalt. They hung tough in the third quarter, leading 30-18 with just 15 minutes to go. It was only a matter of time before the Lions would get untracked – and they did. I was hoping so hard Calgary could hold on. The Lions mounted a furious comeback with two touchdowns, but Calgary hung on for the 35-32 win. Joe Barnes passed for 495 yards, including three touchdowns, and kicker J.T. Hay's fourth field goal gave the Stampeders their first win with new coach Bud Riley. Lion quarterback Roy Dewalt, after getting untracked, passed for 491 yards, and Lion receiver Mervyn Fernandez had a league-wide, season-high of 259 yards receiving. The Lion offensive numbers are deceiving because they had to play from behind the entire time and throw virtually every down to get back into the game. It was the Stamps' first win of the season, and one of very few bright spots that season for the team. It was total role reversal the other night. I have written elsewhere about the troubles the Stampeders of that era were experiencing. Yet, that game symbolized so many things. It showed that on any given night any team can beat any other team in the CFL, no matter what their records say or what the experts predict. It showed that if a team can just stay close, their confidence will grow and they will begin to believe they can win. Once they have that belief, anything can happen. And, it showed the magic of the CFL. Back in 1985, my mother sat down simply to say goodnight before bed – then got into the game as much as any seasoned fan. Canadian football can be compelling entertainment. That showed again the other night. She came down to chat, then got into the game as much as I did. Sadly, our combined positive energy could not help the Stamps. It did back in 1985 though, giving me yet another cool memory with my mother. Ya gotta love the CFL.